Children with complex medical conditions often require monitoring of their heart rates, and you may find that your pulse oximeter alarms continuously because the heart rate is supposedly too slow or too fast. But when are these alarms really important? In this article, we will look at what is a textbook normal heart rate, what is normal for your child, and when you should be concerned about a heart rate that is too slow or too fast. Even kids who are completely healthy have a wide range of what is considered a textbook normal heart rate. This heart rate varies by age, activity, and sleep status. Some kids tend to be on the higher side, while others tend to be on the lower side. The chart below shows normal heart rates in beats per minute for children by age and sleep status. Note that these are resting heart rates. A child who is running around, suddenly scared, or otherwise active may have a temporarily faster rate. Children with complex medical needs may not fall into the ranges listed above due to a variety of medical factors. It is important to establish your child’s version of normal. Your child may always run high or low, or may have predictable swings from one extreme to the other. To begin with, you need to establish your child’s baseline. Record his or her heart rate at the same time each day, preferably at least once while awake and while sleeping, over a period of a few weeks. You should see a pattern emerge. If your child is continuously or frequently out-of-range in either direction, a physician should evaluate him or her to make sure there are no underlying cardiac problems. Typically, an EKG will be performed to analyze the heart rhythm and rate, and an Echocardiogram, which uses ultrasound to visualize the heart in action, will also be done. In some cases, a heart monitor may be worn for several days or weeks to see the pattern of your child’s heart rhythm and rate over time. Doctors may also download heart rate data from pulse oximeters in children who use them. Assuming your child’s heart structure and function is found to be normal, your child’s physician may determine that your child’s heart rate is “abnormally normal,” meaning that it beats slower or faster than expected. As we know with kids who are medically complex, their “normal” is often not the same as textbook normal. Children with complex medical conditions commonly do present with abnormal heart rates that are nonetheless normal for them. In some cases, an explanation comes easily, such as a faster heart rate in an older child who is exceptionally small, or a lower heart rate in a child who is minimally active, both physically and cognitively. In other cases, there may be a problematic cause for the abnormal heart rate. For example, children with chronic pain often have faster heart rates, as do children who are chronically dehydrated or taking certain medications. Children who do not regulate automatic body functions like temperature very well may also present with heart rates that are too fast or too slow. Other conditions that may lead to bradycardia or a slow heart rate include: low oxygen levels, low body temperature, abnormal potassium levels, medications, low blood sugar, thyroid problems, malnutrition, dysautonomia, or reflux. In some children, certain actions, such as suctioning, coughing, or vomiting, may also cause a low heart rate. Other conditions that may lead to tachycardia or a fast heart rate include: infection/fever, medications (very common), dysautonomia, pain, thyroid problems, anemia, anxiety, electrolyte abnormalities, dehydration, malnutrition, or diet. If your child is staying within his or her range of “abnormally normal,” there is no reason to be concerned. In addition, it is not uncommon for children to have occasional spikes or drops in heart rate. If your school-age child is alarming with a few drops into the 50s at night, it probably is not an issue. Similarly, even a vivid dream can raise the heart rate suddenly at night. You should worry if your child suddenly develops a much faster or slower heart rate. In most cases, assuming the heart is structurally normal, the cause will be something extrinsic, meaning other than the heart. Fever, infection, and pain are some of the most common causes of a suddenly increased heart rate. 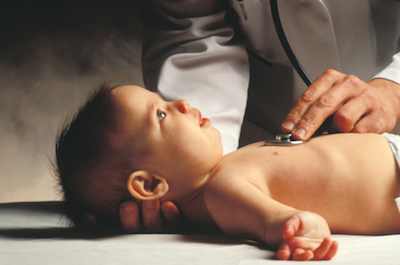 Your physician can be very helpful in identifying safe parameters for your specific child. A certain level of a sustained high or low heart rate, for example, might mean a specific child should have labs done and be given a checkup for a serious infection. Talk to your physician about which parameters should trigger action.